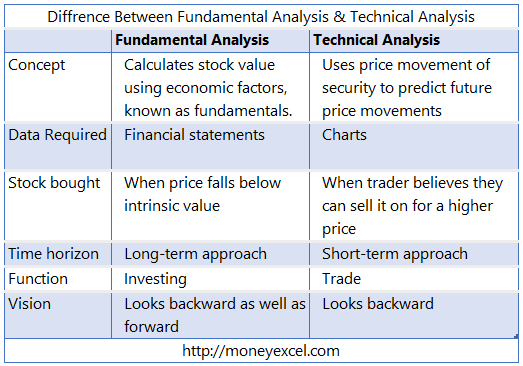 Technical Analysis or Fundamental Analysis - Which is better? Home » Stock Market » Technical Analysis or Fundamental Analysis – Which is better? What is Technical Analysis? What is Fundamental Analysis? How these methods works? Well, before answering these question let’s take a look at a practical situation. We keep on hearing that a company has “Strong Fundamentals” when we look at any stock market analyst. Another thing we hear is It is must buy stock, as fundamentals of the company is strong. So what exactly fundamentals are, how and when they are analyzed. In this post, I will try to answer these questions. 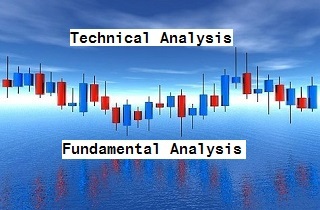 Technical analysis and Fundamental analysis are two principle methods for stock analysis used by stock market experts. Prima facie Fundamental analysis is done for the investment and technical analysis for trading. Both methods are totally separate. Let’s try to figure out which one is a better method for stock analysis. Fundamental Analysis (FA) is a method to identify fundamental (intrinsic value) of the stock. Fundamental analysis is done by collecting financial statement and doing research over data such as revenue, expense, growth prospects etc. Technical Analysis (TA) is a method to analyze the supply and demand of the stock. Technical analysis is done by collecting and analyzing data of people’s buying and selling, price variation, momentum, patterns, plotting stock on the chart and doing a various statistical analysis. The basic objective of the Technical analysis is forecasting future stock price. For technical analysis, you need to analyze data, patterns, charts, and a lot of other things. An outcome of TA is to get information about demand for the company’s stock. In nutshell, technical analysis is aimed at finding out the demand of stock and market behavior for forecasting stock price for trading. Also Read –How to analyze the fundamentals of the company? In order to simplify the concept of FA and TA let’s take a look at one example. Let’s say you want to buy gold for investment and not for usage. So, your objective is to gain from an increase in gold price over a period of time. Now before making an investment decision, you need to do the analysis. Let’s try to apply Fundamental and Technical Analysis and see how it works. Fundamental analysis, in this case, would be analyzing gold quality, structure, form, historical performance, future prospects, purity of gold etc. If you feel that investment in gold is worth at current valuation you invest in the gold. Technical analysis, in this case, will not focus on the gold and its attributes. It will focus on demand, trend, and momentum. Based on these factors future price is predicted and if it’s deemed appropriate you buy gold in order to sell to someone at a higher price on the rise in demand. I hope from above example you have got clear idea about FA and TA. FA focuses on the asset and TA focuses on the market outlook and perception about the asset. How to learn Fundamental Analysis and Technical Analysis? There are two ways to learn these methods. Self-learning – In this method, you have to learn these techniques by self. You can read books or take help of internet and youtube in order to learn these techniques. Classroom training – In this method, you need to take classroom training for learning. There are many experts who teach these techniques. You need to spend money but it is a better method for learning. Well, it is very difficult to say FA is better or TA is better. Both have their own advantages and disadvantages. The advantages of FA is it provides investment decision based on fundamentals of the company. However, it is generally used for long-term investment. You need to hold stocks for several years before it makes any gain. Similarly, advantages of TA is it helps you to get an idea about when to enter and exit from the stock. However, if you use only TA you may end up buying low-quality stock. So, it is advisable to use both methods fundamental analysis and technical analysis. Do you use fundamental analysis or technical analysis for stock market investment? Thanks for sharing the Difference. Is there any online classes or courses to learn Fundamental and Technical Analysis?